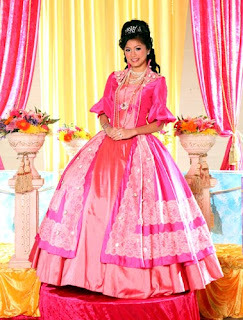 "Kung Tayo'y Magkakalayo" was a star-studded telenovela that starred Queen of All Media Kris Aquino as Kim Chiu's mom. Coco Martin was just one of the supporting casts then. He has since gone on to star in his own TV series. The same thing with then newcomer Jessy Mendiola who was Coco Martin's love interest in the series. This was a pretty good soap as it combined drama and action. Kim's character was a breather too as it featured her as a rebellious daughter, a role she rarely plays. Dahil May Isang Ikaw was nominated in the 2010 International Emmy Awards in the Telenovela category and Sid Lucero for Best Performance By An Actor for his role as Alfred "Red" Ramirez. This was also the reunion project for former loveteam Jericho Rosales and Kristine Hermosa. Lorna Tolentino also made a comeback in this project. I remember there was an issue with Lorna and Chin Chin in one of the confrontational scenes of the show too. Karylle's portrayal of her character was pretty good, but I haven't watched her in a local drama in a while. 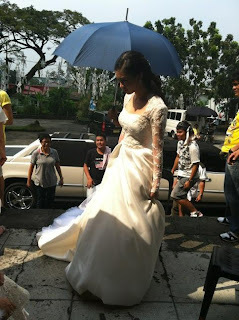 Last Friday's finale of "My Binondo Girl" featured Kim Chiu wearing a wedding gown very similar to the one worn by Princess Kate. It was very lovely indeed. But then again, I would consider Kim Chiu as one of the luckiest young actresses as we have previously seen her wearing the loveliest wedding gowns in her past TV series. Here's a pictorial picture from "Kung Tayo'y Magkakalayo," another Kimerald telenovela that also starred Kris Aquino, Maricar Reyes, Albert Martinez, Gabby Concepcion, Coco Martin, and Jessy Mendiola. Two of the hottest local actresses, Kim Chiu and Maja Salvador. Both wore Camille Garcia bridal gowns on the cover of Wedding Insights Magazine. Kim starred in the recently concluded "My Binondo Girl" where she wore another lovely wedding gown -- soon to be featured here too. Maja will star in the upcoming movie "My Cactus Heart" and new afternoon telenovela "Lumayo Ka Man Sa Akin." The star-studded sequel to the popular "Maging Sino Ka Man" telenovela that left some memorable lines from Sam Milby and Anne Curtis. Their romance also supposedly also started during the first series. But if there's one tandem I would want to watch on TV again, it would be Bea Alonzo and John Lloyd Cruz. 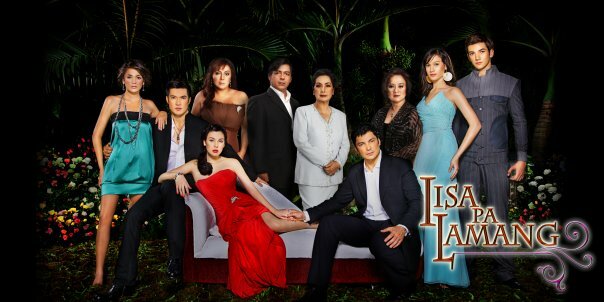 "Tayong Dalawa" was another star-studded telenovela. Agot Isidro's performance was outstanding. The ending (with Rosanna Roces and Enchong Dee) was rather strange though. They probably thought of a sequel but never pushed through. And Coco Martin, from being second lead, has now become one of the most sought after leading men. Do you remember this telenovela that starred Bea Alonzo, Gretchen Barretto, Angel Aquino, and Erich Gonzales? I actually liked Angel Aquino's portrayal of Vera. But I believe it was Gretchen who bagged a best actress award for this teleserye. Alas, Claudine Barretto's last telenovela for ABS-CBN Kapamilya network before making the move to GMA-7 Kapuso network. Memorable lines from both Catherine and Scarlet played by Claudine and Angelica Panganiban, respectively. I believe Angelica has successfully reinvented herself in this teleserye. 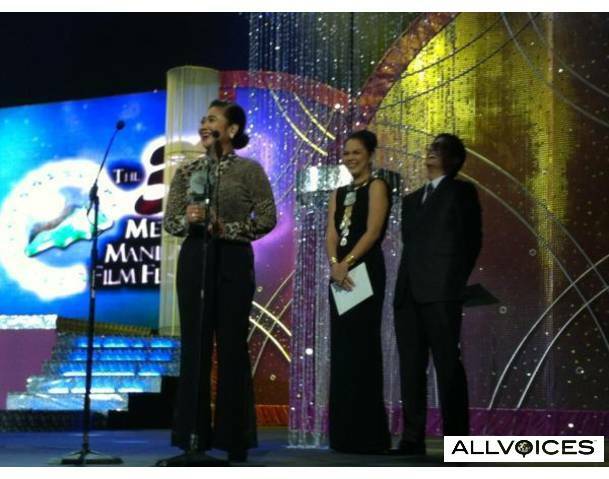 The 37th MMFF Awards Night was hosted by John Estrada, Ai-Ai de las Alas, and Richard Gomez. Ai-Ai starred in "Enteng ng Ina Mo" which won second best picture. Judy Ann Santos and husband Ryan Agoncillo presented the Best Supporting Actress award to Eugene Domingo, who starred with them in "My House Husband." The cast of "Yesterday, Today and Tomorrow" didn't attend the awards night but Maricel Soriano bagged the Best Actress award. The 37th Metro Manila Film Festival (MMFF) awards night was held on December 28 at the Newport Performing Arts Theater in Resorts World Manila, Pasay City. Iza Calzado won Best Actress in the New Wave category for her role in the full-length indie film HIV. Ryan Agoncillo and Iza Calzado were called the most glamorous male and female stars of the night. Concert Queen Pops Fernandez rendered a song number together with the Philippine Tesalonica Choir—a medley of some of the most memorable theme songs used in MMFF movies through the years.